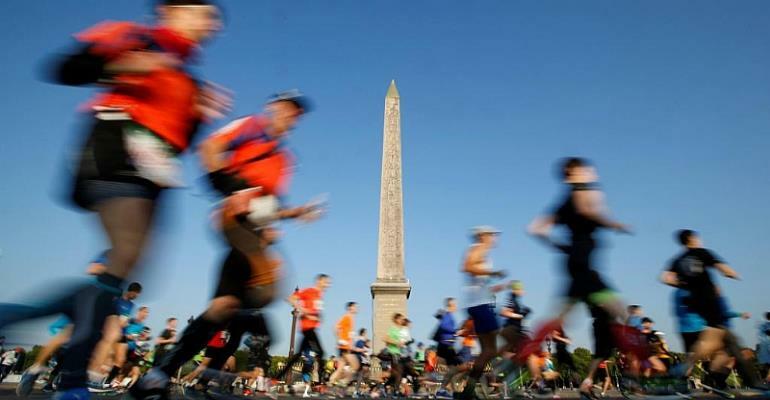 Thousands of runners took part in the 43rdParis marathon on Sunday, which saw Ethiopia scoop a men's and women's double with wins by Abrha Milaw and Gelete Burka. The elites were not the only ones giving it their all, many amateur runners as well. Eleven-year old Aurélien Dujardin said he came to support his mother Caroline on her first marathon. "I'm very proud of her," he told RFI, accompanied by his father Laurent. Both men watched anxiously for a glimpse of Caroline among the thousands of runners near the Eiffel Tower, ready to cheer in unison. Such support was priceless for participants such as Tom Fraser from London. "The crowds are just fantastic, the whole way through," he told RFI. "Especially in that last hour when you're really backed against the wall. It's really tough, but the crowd pull you through." Fraser took off at 8:30 am on Sunday, shortly after the wheelchair athletes and elite runners, securing a personal best time of 3 hours and 27 minutes. "I'm absolutely over the moon with that," said the two-time marathon runner, who celebrates his 30th birthday next month. After six months of training, "it's nice to have it done," he commented. The day was blessed with fine weather – bright sunshine but with a nip in the air. Perfect weather for Spanish runner Paula Mas. "It is cold but not too cold and there's sun. It's perfect, at least for me," she told RFI. What Mas also appreciated was the monument-steeped course that took runners past some of Paris' most famous sites. "Paris is a beautiful city, and you can run along all the main monuments, and you have also the gardens; so it's a nice city to run," said the 35-year-old. Her favourite monument was Opéra Garnier, one of two new sites added to the 2019 route along with the Place Vendôme. "You're running just in front of the Opéra; and then you turn around and when you look back, you see the Opéra Garnier and it's so beautiful," she said. The beauty of the surroundings however did little to disguise the pain of running 42 kilometers, which saw some runners vomit, limp, or rub their legs down afterwards with muscle rub to soothe the pain. "Yes I have some muscle pain," admits Mas, who completed the marathon in 3 hours and 50 minutes, a new personal best time for her too after clocking more than 4 hours in her last marathon in Valencia in 2016. "But if you have trained well beforehand it will pass," she said, drawing from her 20 years of experience. Elsewhere, locals such as Nicolas Mauny, dismissed the aches and cramps. "Of course we have pain, that is all part of the pleasure of pushing yourself to the limit," he told RFI. "A lot of the times, people think that we are courageous, but we're not. We run because it makes us happy," he said. Mauny, who completed the marathon in 4 hours, said his next objective was "a pint of lager" and quality time with his family.